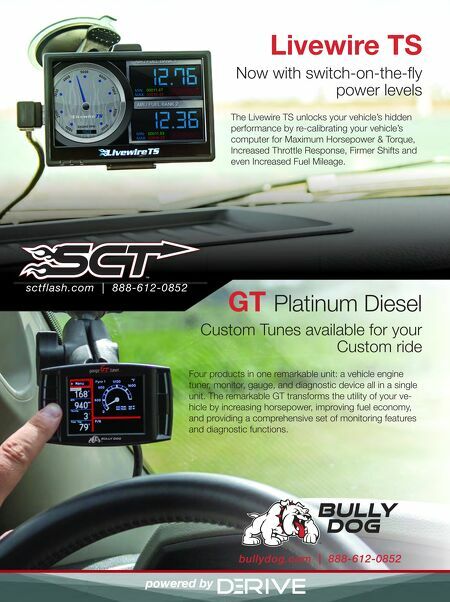 8 n Performance & Hotrod Business n April 2015 n Performance news What's new with you? Mail your news items to Performance News at Performance & Hotrod Business Magazine, PO Box 1416, Broomfield, CO 80038; fax us at (303) 469-5730; or email pbeditor@nbm.com. 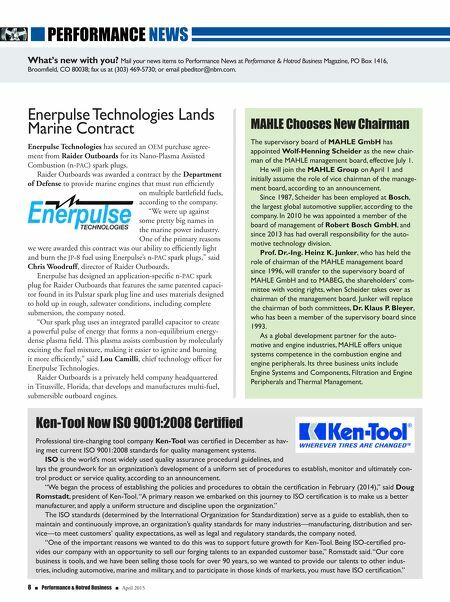 Enerpulse Technologies Lands Marine Contract Enerpulse Technologies has secured an OEM purchase agree- ment from Raider Outboards for its Nano-Plasma Assisted Combustion (n-PAC) spark plugs. Raider Outboards was awarded a contract by the Department of Defense to provide marine engines that must run efficiently on multiple battlefield fuels, according to the company. "We were up against some pretty big names in the marine power industry. One of the primary reasons we were awarded this contract was our ability to efficiently light and burn the JP-8 fuel using Enerpulse's n-PAC spark plugs," said Chris Woodruff, director of Raider Outboards. Enerpulse has designed an application-specific n-PAC spark plug for Raider Outboards that features the same patented capaci- tor found in its Pulstar spark plug line and uses materials designed to hold up in rough, saltwater conditions, including complete submersion, the company noted. "Our spark plug uses an integrated parallel capacitor to create a powerful pulse of energy that forms a non-equilibrium energy- dense plasma field. This plasma assists combustion by molecularly exciting the fuel mixture, making it easier to ignite and burning it more efficiently," said Lou Camilli, chief technology officer for Enerpulse Technologies. Raider Outboards is a privately held company headquartered in Titusville, Florida, that develops and manufactures multi-fuel, submersible outboard engines. maHLe chooses new chairman The supervisory board of MAHLE GmbH has appointed Wolf-Henning Scheider as the new chair- man of the MAHLE management board, effective July 1. He will join the MAHLE Group on April 1 and initially assume the role of vice chairman of the manage- ment board, according to an announcement. Since 1987, Scheider has been employed at Bosch, the largest global automotive supplier, according to the company. In 2010 he was appointed a member of the board of management of Robert Bosch GmbH, and since 2013 has had overall responsibility for the auto- motive technology division. Prof. Dr.-Ing. Heinz K. Junker, who has held the role of chairman of the MAHLE management board since 1996, will transfer to the supervisory board of MAHLE GmbH and to MABEG, the shareholders' com- mittee with voting rights, when Scheider takes over as chairman of the management board. Junker will replace the chairman of both committees, Dr. Klaus P. Bleyer, who has been a member of the supervisory board since 1993. As a global development partner for the auto- motive and engine industries, MAHLE offers unique systems competence in the combustion engine and engine peripherals. Its three business units include Engine Systems and Components, Filtration and Engine Peripherals and Thermal Management. Ken-Tool now Iso 9001:2008 certified Professional tire-changing tool company Ken-Tool was certified in December as hav- ing met current ISO 9001:2008 standards for quality management systems. ISO is the world's most widely used quality assurance procedural guidelines, and lays the groundwork for an organization's development of a uniform set of procedures to establish, monitor and ultimately con- trol product or service quality, according to an announcement. "We began the process of establishing the policies and procedures to obtain the certification in February (2014)," said Doug Romstadt, president of Ken-Tool. "A primary reason we embarked on this journey to ISO certification is to make us a better manufacturer, and apply a uniform structure and discipline upon the organization." The ISO standards (determined by the International Organization for Standardization) serve as a guide to establish, then to maintain and continuously improve, an organization's quality standards for many industries—manufacturing, distribution and ser- vice—to meet customers' quality expectations, as well as legal and regulatory standards, the company noted. "One of the important reasons we wanted to do this was to support future growth for Ken-Tool. Being ISO-certified pro- vides our company with an opportunity to sell our forging talents to an expanded customer base," Romstadt said. "Our core business is tools, and we have been selling those tools for over 90 years, so we wanted to provide our talents to other indus- tries, including automotive, marine and military, and to participate in those kinds of markets, you must have ISO certification."